I recently added one more Viburnum dentatum (commonly known as arrowwood) to our Pleasant View native plant garden. There are now seven -- all looking like nondescript twiggy shrubs at this point. 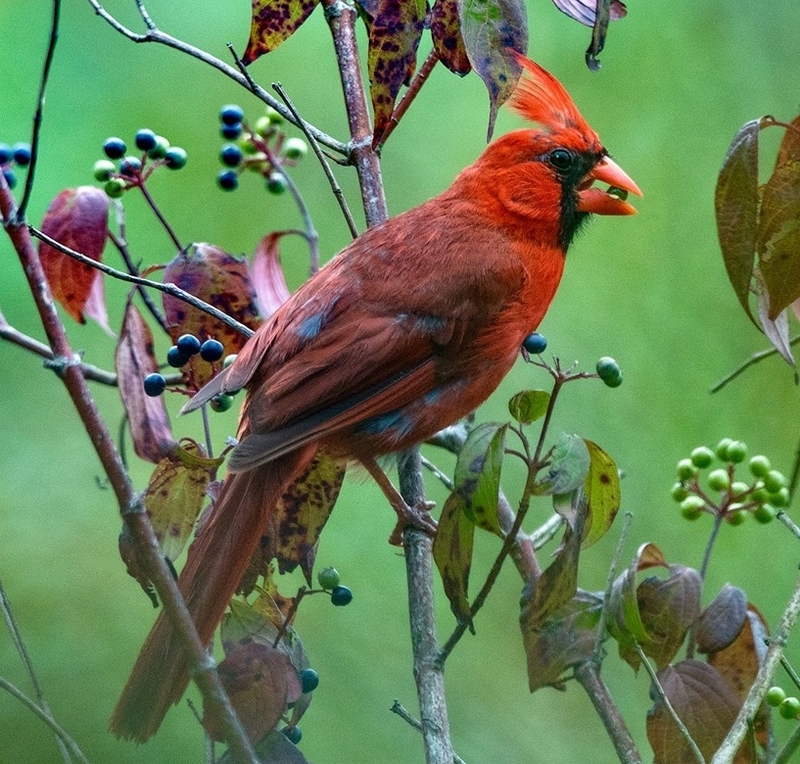 But within a few years they will provide habitat similar to this photo by Ralph Johnson of a cardinal eating arrowwood fruit. Photo taken at Huntley Meadows, Alexandria, Virginia by Ralph Johnson. There are a number of commonly sold cultivars of this plant including 'Blue Muffin,' and 'Chicago Jazz'. In my garden I've found it to be a completely no maintenance shrub. Once established there's no need to water or trim it (if planted with adequate space). Deer generally leave it alone but it's worth protecting in the first year. It's not a dramatic bush but pleasing. Small white flower clusters in June, blue fruit in late summer, some color in fall. As this photo above shows, it pleases the birds. As you can see in this photo, the shrub eventually gets quite large. In my home garden I have two of these shrubs growing along the back of my garage making a green barrier so you only see that part of the garage in the winter.